This week’s Major Crime Facebook chat with creator/writer James Duff featuring Tony Denison. 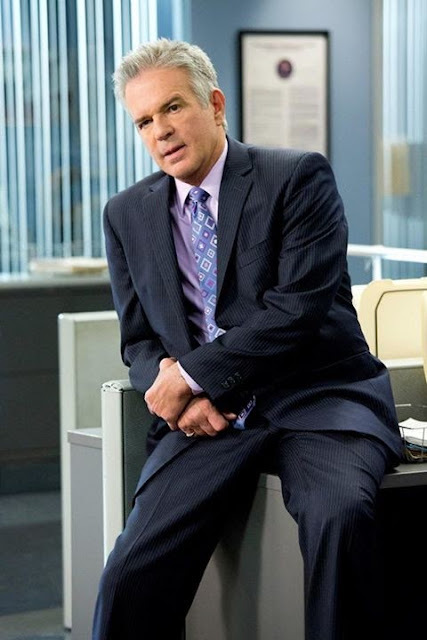 Tony plays one of my favorite Major Crimes/Closer characters, Andy Flynn. (You can read more about Tony and his on-screen off-screen pal, G.W. Bailey riding in the Bacchus parade at Mardi Gras here.) These are all James Duff's answers to questions asked by Facebook fans and because of the volume of comments it's pretty hard to match the questions to the answers. Luckily for us, James puts enough of the question in the answer, so you get the gist. Of course, our real question is, "Will the Andy Flynn character be paired romantically with the character of Sharon Raydor?" James Duff - Hey everyone. Here with the one and only Tony Denison! And ready to answer your questions. Hope you're watching it on television with us. James Duff - @Courtney Gibson, Tony says the dynamic between him and Provenza is very much like what you see between action and cut in the script, with the difference being that he is slightly more funny in real life! James Duff - Actually, I think Tony dresses better on the show than anyone else, and that Phillip (Buzz) dresses better than anyone else in real life! James Duff - @Mara R., yes we have some things up our sleeve for Flynn. You're about to hear about one of them tonight! James Duff - @Darrell M.,we're ready to do a season three. Right after we finish season two! James Duff - A little sad that we only have eleven episodes this summer, but happy to be in your homes over the holidays, like we use to be. James Duff - @Scott K., we will have episodes this winter. Eight, which is three more than we usually do! James Duff - @Roger B., next week I kind of lived the dream of having special actors. Never did I dream Tim Conway and Marion Ross and Ron Glass and Paul Dooley and Doris Roberts and Paul McCrane, all in one episode! James Duff - Tony does get picked on. Absolutely. But it's because he loves the attention! James Duff - Hi, Elizabeth E! We have hopes of bringing in Sharon's children this year, but no promises! Still lots of stories to break. James Duff - Tony has done hardly anything but laugh tonight! He would fall in love with everyone who read with him. James Duff - @Stacey M., Tony says he's Sicilian, and that sort of says it all. I hate to agree, but I think I have to. James Duff - I have been close friends with Tony for over twenty years, and I can tell you, he has a great sense of humor. And it is because people are always making jokes about him. James Duff - @Julia S, Tony says the best sense of humor on set award would probably go to G.W., but that he deserves it because everyone picks on him! James Duff - @Emanuel T., thanks so much for complimenting our episodes. I think working hard on them improves the chances they will be good. And we work REALLY REALLY hard. Also, we are extremely collaborative with each other. And Tony points out the actors are pretty good. And he's right! James Duff - But usually I like to cast actors. Just actors. Just very, very good actors. Hollywood is chock-a-block full of brilliant actors you've never heard of. Finding them and putting them on screen is a passion. James Duff - @Linda Y. The actors don't get nervous when we use political events in a story line because we don't take political stands. James Duff - It's not very often we get to play and write the same characters for such a long time. And Tony always finds amazing things. And it's worth every moment I've spent having to listen about Crime Story. James Duff - @Gracie A, Tony says his work on The Closer and Major Crimes has taught him how enjoyable it is to spend so much time in one character, and continually explore where he and Flynn converge. James Duff - @Rita W., Andy knew Sharon from when he was in Robbery/Homicide and her time in Internal Affairs (Professional Standards). Andy's file is very thick. Like Tony's head. James Duff - @Teresa S., Tony should have a romantic interest. But it should take him by surprise. And while he would probably like nothing better than to audition all the people who want to play opposite him, I will not allow it! James Duff - I'm about to be locked out for commenting too much, so Tony and I say thank you for jumping in with us and I'll be back next week for our special ep. Look! It's Lori Laughlin, one of my favorite actors on earth! That's it for this week. You can read other Major Crimes Facebook chat recaps here. I just started the last season of The Closer so I am looking forward to then beginning Major Crimes.